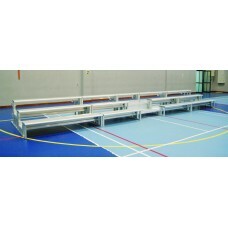 The aluminium bleacher Mobile One is made from aluminium. It provides space for up to 50 people. The seating profiles are made from anodized aluminium. The set consists of five peices. The pieces can be assembled. The whole set has a total length of 8.6m and depth of 2m. The height of the bleachers is 0.85m. The back rows can be accessed by stairs. Every piece of the bleachers is equipped with four turning wheels. The wheels are made from polyamide. 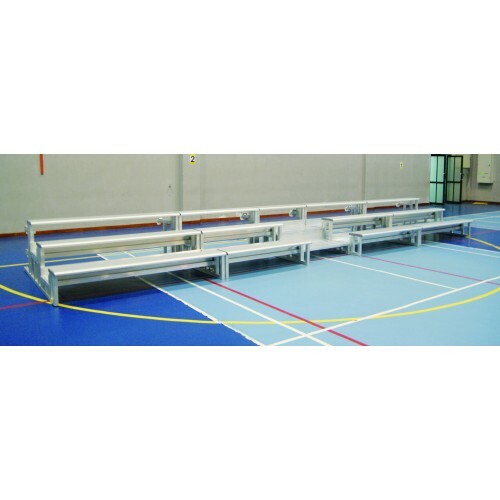 The bleachers can be used for indoor and outdoor.